Alive or Dead, Not ours to tell. We have a few more floors to gain. If I can so can you. Right now I need the best from you. and some concrete falling down. Eyes raised, heading for the top. Remember Them, They didn't stop. Climb up to that light. That angel's hand will lead the way. You did Your Job Today. 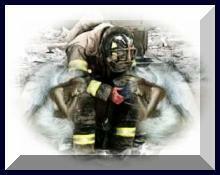 Please visit Janice's site in honor of the New York City Fire Department. It's a wonderful tribute to the men and women who worked so hard and lost so much.